Five years ago, US Border Patrol Agent Brian Terry was killed by criminals who obtained weapons supplied by Operation Fast and Furious. Five years later, we still don’t have answers. You might remember Trek’s Trek, 2,000 Miles for the Brian Terry Foundation. One man and his bike, raising awareness and funds to support the Brian Terry Foundation (BTF). It was a pretty epic journey that Trek will likely never forget. Well today Trek is back, this time sans bike, with the announcement below of the second Danger Zone Auction, an auction starting in January to raise money for the BTF. The Danger Zone Auction will be two parts: one part will be live at SHOT Show 2016, and the second part will be online at GunBroker.com starting January 2. There are a LOT of items up for bid, and each item will have its own auction page where anyone with a GunBoker account will be able to participate (GunBroker accounts are free). 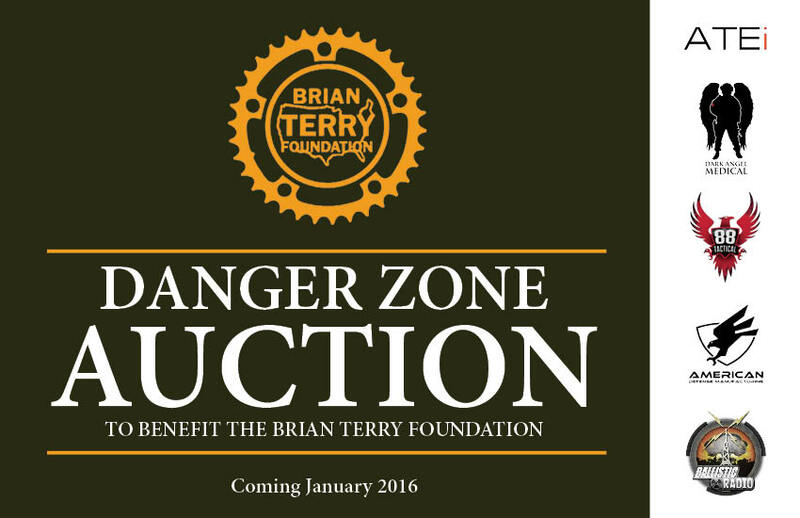 Each auction will terminate at midnight PST on January 21, which is the night of the Danger Zone event at SHOT Show. Stay tuned for more information on how you can bid on some great gear to support an even better cause, and check out the press release below. It has been 5 long years since US Border Patrol Agent Brian A Terryâ€™s life was taken by criminals armed with weapons supplied by the US Governmentâ€™ failed OPERATION: FAST AND FURIOUS. Since then, only foreign actors involved in the killing have been brought to trial and convicted in US courts. To this day, not a single member of our government has been held accountable for their roles in an operation that armed narco-terror groups and cost the lives of hundreds if not thousands of innocents including Brian Terry. At every turn, powers that be in our own administration continue to keep answers from the family of a man who gave all for his nation. Today, Brianâ€™s family continue their quest for answers all while working to ensure that the legacy of Brian A Terry remain in the forefront of Americans everywhere. A Marine, small-town cop, Border Patrol Agent, and member of the esteemed BORTAC, Brian was the epitome of a patriot looking only to make the world a better place. The Brian Terry Foundation continues that legacy in its many missions. 100% volunteer run by Brianâ€™s family, the BTF fights to get answers and accountability regarding Brianâ€™s murder, offers scholarships to young people on their quest to become law enforcement officers, and gives assistance to the families of fallen Border Patrol agents in need. Throughout January, all Americans will have the opportunity to join an amazing fundraising auction that will continue to fund the BTF for years!Â The online superpower GunBroker.com has generously offered the use of their site fee-free where over 50 items from across the firearms and firearm training industry will auctioned off and 100% of the proceeds heading to the Brian Terry Foundation. We want answers. With your help, weâ€™ll get them. What a terrible shame Border Patrol officer Brian Terry was murdered by invading illegal alien scum. Even worse it the fact that he was murdered by weapons provided to the illegal aliens by our own government. Even worse yet is that NO ONE in our government has been held accountable for any of this. But we all know that if a Border Patrol officer had killed an invading illegal alien, that would be wall to wall news coverage to this day. But for all intents and purposes. Brian Terry has fallen off the face of the earth. IF an officer is shot by and illegal alien and the propaganda machine calling itself the news media doesn’t report it. Did it make a sound?